When I was a kid, it seemed that Ronald Reagan was our perma-president... his voice always steadfast and grandfatherly, his vigilance always creasing his brow, his hair always black and cuniformed, a 1940s comma. President Reagan was made of Teflon, we shall note. 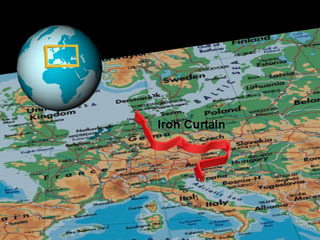 Back then (the '80's that is), "red states" referred not to the majority party in charge of the legislative and executive branches of the American government, but to the vast, sprawling area of Soviet influence, known as Behind the Iron Curtain. It is Nancy Reagan, in the end, who is credited with ensuring that red would become associated with the vigor of the Party of Lincoln. A fantastic re-interpretation of the globe by artist, Ingo Gunther, showcases oodles of globes showing the planet in various states of dissolution, decay, and demographic duress. See his fine assortment of globes, at www.worldprocessor.com in process since 1988 [the first post-Ronnie year, by the way]. You can navigate these colorful and daunting gems by number, title or visual. R U a Pro-Am, 2?